Welcome back! Let’s jump into another week of recipes! We had a bit of a hectic week last week, so the Tomato Scallion Shortcakes with Whipped Goat Cheese we were supposed to make Tuesday night actually turned into lunch Saturday afternoon (which you can read about here) and Tapas Night, which was supposed to be on Thursday night, didn’t happen at all. Since we’re going to another Yankee game Sunday afternoon, we figured we could reschedule Tapas Night for Sunday. As before, the menu will include Chorizo with Honey, Grilled Asparagus with Manchego, and Mushrooms with Thyme. We still have the bottle of cava we ordered last week, so we’ll be opening that with dinner. 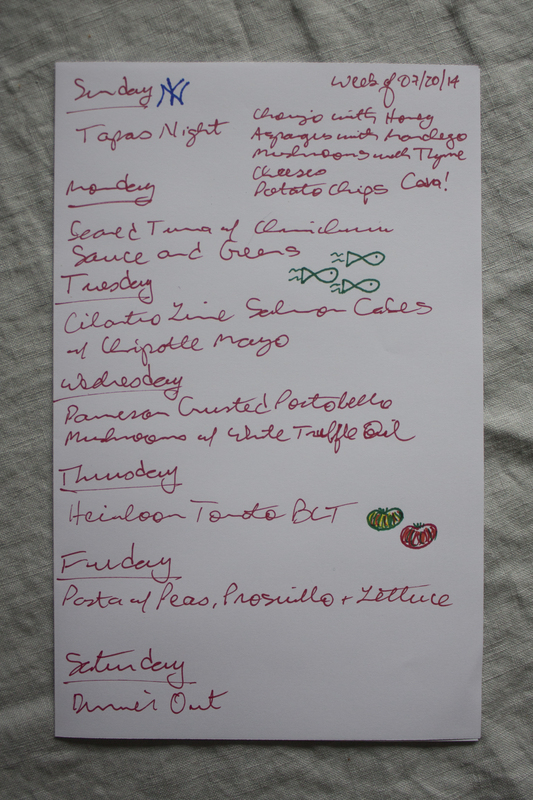 On Monday night, we plan to make Seared Tuna with Chimichurri Sauce and Greens. This recipe is a good example of how we sometimes pull together ideas from different places to design a meal for a given day. While reading the food section of the New York Times Magazine Saturday morning, we saw an interesting recipe for Chimichurri. It caught our eye because is contains oregano, which we still have left over from the Greek Salad with Oregano-Roasted Salmon. We saved the Times recipe for future use and then started checking Fresh Direct to get more ideas. We saw that tuna was highly rated and on sale and when we started looking for tuna recipes, we found one on the Food & Wine website (www.foodandwine.com) that, coincidentally, uses chimichurri. So, we’re mixing and matching recipes for the tuna dish, taking the cooking directions and salad from Food & Wine and the chimichurri recipe from the New York Times. We’re going to pair this with a bottle of Montes Sauvignon Blanc. Tuesday night, we’re going to make Cilantro Lime Salmon Cakes with Chipotle Mayo. This recipe is not hard, but it has a few more steps than most of the recipes we use, as it calls for, of course, cooking the salmon, using it to make the cakes, and then browning the cakes. It sounds a like such a great summer dish that we’re going to give it a go and pair it up with Sierra Nevada Pale Ale. When we travelled to Tuscany this May, we visited the Torciano vineyard for a tasting and lunch. The main course was lasagna, a recipe we’re going to try to replicate for a special anniversary dinner we’re going to make with our friends Tom and Sharon on Jan 3rd, which is almost exactly halfway between their 1st anniversary and our 5th. What made the lasagna extra special was that it was drizzled with truffle oil. We ordered a few bottles of wine, including a special bottle for our anniversary dinner, and a bottle of the truffle oil. When the delivery arrived this week, we knew we needed to make something that used the oil and went with the wine. We were excited to find Bobby Flay’s Parmesan Crusted Portobello Mushrooms with White Truffle Oil, which we’ll have with one of our bottles of Torciano Baldassarre Rosso Tuscano. Tony realized that the week was trending very vegetarian/pescatarian, so he decided what we needed was some bacon. So, on Thursday night, we’re making Heirloom Tomato BLTs. Heirloom tomatoes are in season in late summer, so we’ll probably make a few things using them in the coming weeks. They are really delicious and more interesting, flavorful, and colorful than regular tomatoes. We’ll have the BLT’s with some more of the Sierra Nevada Pale Ale. Finally, for Friday, we’re going to make a pasta dish that we rally enjoy (and that has the added benefit of letting us use up the lettuce! ): Pasta With Peas, Prosciutto and Lettuce. When we first found this recipe about four years ago, we thought that the idea of lettuce in pasta was a little odd, but we really enjoyed it and have come back to it at least once every summer. We’ll have the pasta with an Italian white wine, Bastianich Friulano. After another busy week of cooking, we’re planning to have dinner out on Saturday night, but we’re looking forward to trying several new recipes this week!